Foot Wise Podiatry is in rural south-west Northamptonshire, in a former railway village called Woodford Halse. This is 12 miles from Banbury and 10 miles from Daventry, easily accessed from the the two mini roundabouts on the A361 at Byfield (see map on the Finding Us page). 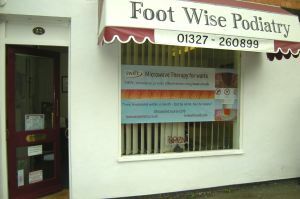 Foot Wise Podiatry is a private practice chiropody clinic. As such, patients may refer themselves for the available treatments and advice (a GP referral is not necessary). Established in September 2005, Gary Denby BSc is the owner and podiatry practitioner. Gary is trained to NHS proficiency and is registered as a Podiatrist / Chiropodist with the Health and Care Professions Council (CH 22024) and with the College of Podiatry (26657). Public liability and medical negligence insurance is maintained. A wide range of foot and lower limb assessments and treatments are available for all ages. For example, gait assessments for youngsters prone to tripping; leg pains and ingrown nails associated with adolescents; muscle strains and verrucae common with the active adult; corns, callus and bunions associated with footwear and poor foot mechanics; also fungal nail treatments for thickened, crumbly, slow growing nails. Corrective, client-specific shoe insoles are manufactured on site. Dermoscopic assessment and photographic monitoring of suspicious moles and other skin lesions are also available. **NEW** FOR MARCH 2017: A revolutionary new treatment for warts and verrucae using SWIFT microwave therapy. Far less painful than cryotherapy, not breaking the surface and no need for any dressings, this uses a heat-shock approach to trigger your immune response, even for long standing and otherwise unresponsive warts. Foot Wise Podiatry is able to supply Salford Insoles for £50, when included as part of an assessment and treatment. Developed by Salford University in 2009, these provide effective functional control using a unique anti-microbial plastic with remarkable flexibility-rigidity characteristics, according to thickness. They provide a thin, neutral heel cup and a carefully contoured arch filler, enabling them to 'lock into place' for most foot types, providing good control and support for painful feet. This is a fee-paying practice, with reductions for those 60+ requiring simple nail or corn treatments. Debit and credit cards, cash and cheques are accepted. Payment is on the day of appointment, or in advance for discounted courses of treatments. Receipts are available for re-claiming costs from health cash plans provided by Simply Health or BUPA. There is a charge for missed appointments. There is no charge for changing appointments, if 24 hours notice is given. Appointments can be requested or changed on 01327 260899, with an answering machine for you to leave a message if we are not available. Alternatively, click on the above photo and register your details, then choose an available appointment that best suits you. Minors below the age of 16 years must always be accompanied by their parent or guardian. We look forward to being of service to you. We like to have you walking on air! Site last updated 30 March 2019. Visitors since June 2008:- 147,381.